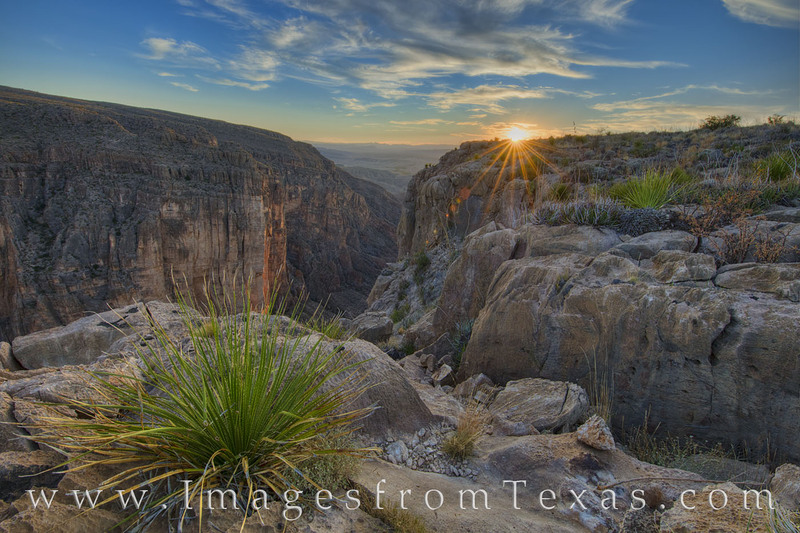 From the rim of Mariscal Canyon in Big Bend National Park looking west at sunset, the sky lights up with the last rays of daylight streaming over one of the rocky promontories along the edge of this abyss. Twelve-hundred feet below, the Rio Grande wanders through high canyon walls – on one side is Texas, the other Mexico. The trek to reach this remote and beautiful location is long – 30 miles down a terrible dirt road and a 3.5 mile walk over terrain only marked by cairns. The first few miles meanders through some flats and washes, then steadily rises over the last mile as you gain the 1200 feet to the canyon rim. The road is long, but the payoff is worth it when you first peer over the vertigo-inducing cliffs. Photo © copyright by Rob Greebon.